2019 Membership Season Is Closed! We are founded as a Community Supported Brewery (CSB). The CSB program is loosely based on the community supported agriculture model (CSA). Traditionally, Farm CSAs sell produce shares, and in exchange, the customer receives a box of fresh produce each week at prices lower than the market rate. Our model will be similar except we will be offering beer shares to our customers. Members will also receive early access to new products, discount on merchandise, invites to attend member-only events, and discounts on additional purchases. In addition to the monthly subscription, we reserve special benefits just for our members. 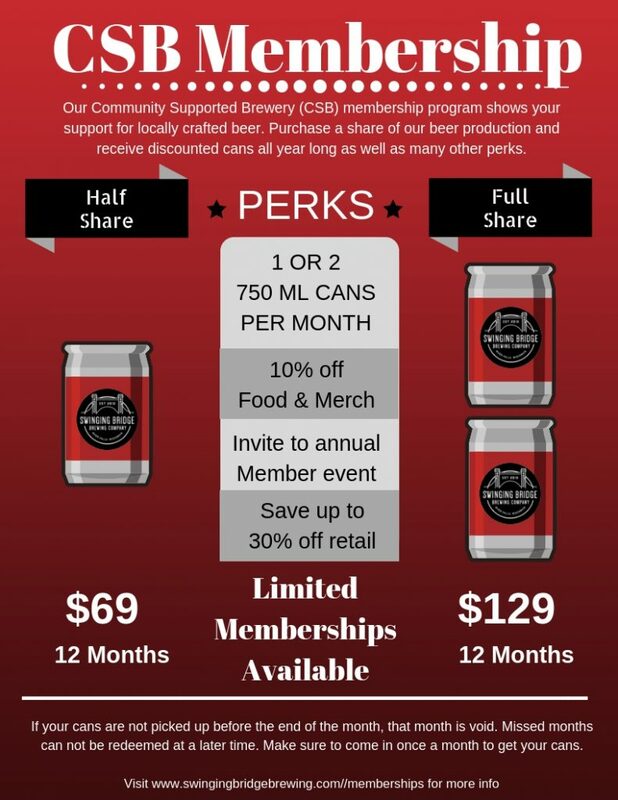 Our CSB memberships run for a one year season starting in January and can be for one or two cans a month. The options and additional info is outlined in the above graphic. Along with monthly cans of beer, a CSB membership will include discounts on merchandise and food purchases in the taproom. We will also have early access to beer releases and members will be invited to the annual member appreciation event. CSB memberships will be limited to 100 every year. Current members have the opportunity to renew in December before shares are released to everyone in January. Memberships sell quickly, and it will be first come first serve basis when the season opens. By signing up for a Swinging Bridge Community Supported Brewing (“CSB”) membership, you or any person for whom you are purchasing the membership must understand and agree to the following Terms of Membership. Your paid membership entitles you to monthly receive the quantity of beer indicated for the level of membership that you have chosen. If you miss a month of picking up your can(s), you cannot make up for it the next month. You can choose any house beer on tap for your can, even premium styles. Only bottle release beer is restricted. Current members are guaranteed spots for the next round of subscriptions, as long as they renew before the new season starts. CSB memberships will begin the month you sign up and will be a duration of 12 months. All sales are final no refunds or exchanges given. CSB subscriptions are for consumers only, wholesale customers cannot purchase memberships. You can buy a subscription as a gift, as long as the person is 21 years of age, and you are 21 years of age. Swinging Bridge reserves the right to terminate a membership at anytime for any legal reason whatsoever. Any terminated member may receive a prorated sale of value of remaining products not received. 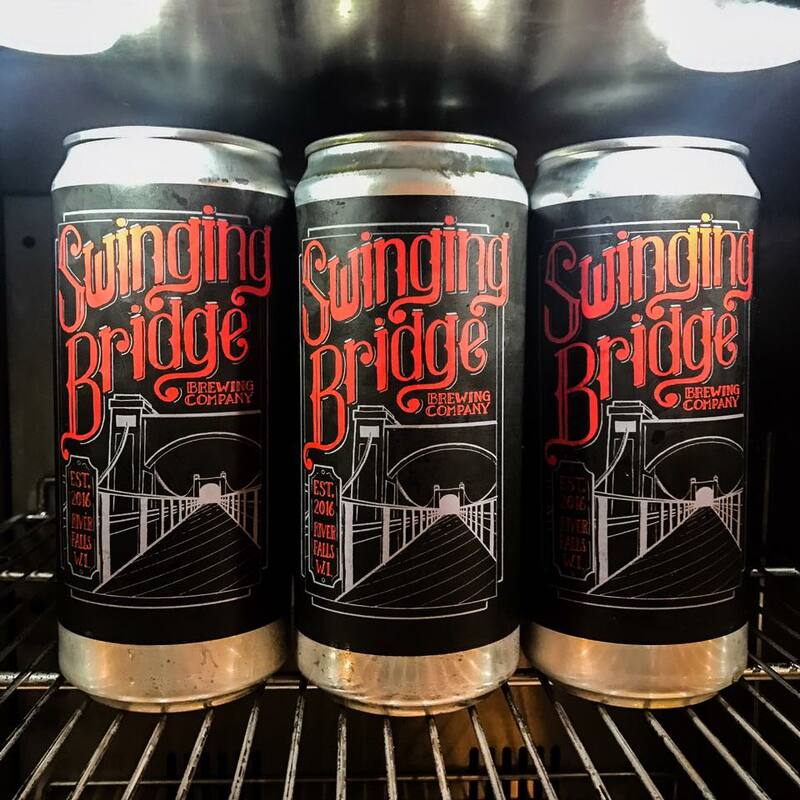 I understand that membership applications and these terms of membership make up the agreement between myself the applicant and the Swinging Bridge Brewing Company. To the extent that any materials are inconsistent with these terms and conditions, these terms and conditions shall control the agreement. Any dispute arising from this agreement shall be governed by the Wisconsin Law, and parties will agree to share costs of any requested mediation equally. Here are a few FAQs about our CSB program. How do I get my beer each month? All subscriptions must be picked up at the Swinging Bridge Taproom. You can pick up your share during business hours any time between the first and last day of each month. What do I need to pick up my share? Bring an ID and have staff look up your name. The membership holder is the only person allowed to pick up, unless otherwise arranged prior to pick up. What is the standard cost of cans? Our standard pricing for a 750ml can is $7-8. CSB price works out to about $5.37 -$5.75! What styles are available for CSB Members? You can choose any house beer or soda on tap to fill your can. That includes premium styles! Only exclusion in sample taps of bottle releases. Are there other membership benefits? Members also receive a 10% discount on merchandise and food purchases. You will also be invited to out annual event for members only with free food and beer! Are current members guaranteed spots for the next round of subscriptions? As long as you renew your membership before the season opens again in January your spot will be saved. When are memberships available? Can I start a membership at any time? New Community Supported Brewery Memberships are available for purchase only during January every year till sold out. Renewals must be accomplished before January to ensure spot is saved. When is payment for my membership due? Payment is due at time of signing up or renewing your membership. How should I pick up if my share includes more than one can a month? If you get more than can per month, you can pick up one at a time or on separate visits during the same month. Shares must be picked up during each month of your subscription. We cannot accommodate if, for example, members skip a month, and then hope to pick up extra the following month. Yes! If purchasing a subscription as a gift you are required, at time of purchase, to designate the person for whom you are purchasing it. Both parties must be at least 21 years of age. What are the Risks & Benefits of Supporting a Community Supported Brewery? CSB members shall be made aware of the risks attendant to supporting a true community brewery. These are risks that all small businesses take, as well as agricultural supply risks, and using local available ingredients. This may delay the delivery of products slightly different than expected. Swinging Bridge Brewing will try to exceed expectations and minimize risk whenever possible. Website Built & Managed by Smart Web Ninja. vulputate, mi, venenatis, consectetur Praesent risus pulvinar elit. risus.